Why aren’t there more pockets in the world? Putting pockets on something can seem like doing work without seeing progress on the project. That is because pockets usually need to be sewn on individual pieces before those pieces are sewn together. It is usually worth it, though, because pockets are very useful. When I am evaluating a pocket, I try to remember it is usually about impossible to add pockets after the fact. Pockets can also affect the bulk and drape of a garment. You should avoid putting pockets in places that emphasis body features that you want to minimize. But you can also use pockets to give more shape or emphasis where it is flattering. What kind of pocket should I sew? It is wonderful to realize that you can decide to add a pocket to almost any project. Think about the type of thing or garment, the type of fabric, and how the item will be used. For instance, I put pockets on the front of the ponchos I sew because if you are wearing a poncho, you are probably trying to stay warm and it is nice to have a special hand warmer spot. Think about what might be put in the pockets. Think about a variety of pocket sizes and closures, because bigger pockets is not always better. Think about accessibility of the pocket or, on the flip-side, security of the pocket. I like to put pockets where they can’t easily be seen or accessed by passersby. Most things you sew can be upgraded by adding more pockets or more than one kind of pocket. I made a flannel shirt for a grandson a couple of years ago that had rows of pockets for all his little cars. I almost always add extra pockets to bags I make. One place I have learned a lot about pockets is from books about making bags or purses, but don’t be limited by what you see. Years ago, I made my husband a case for his bow and arrows for hunting. Those pockets needed to be designed for both the unique shape of the case and the odd assortment of supplies he wanted to carry with it. His friends were all jealous and wanted me to make them one, too, but not when they heard what I would charge! Inset zipper pockets are great for many reasons. They close securely. They can be low-profile. Don’t let the zipper part scare you. 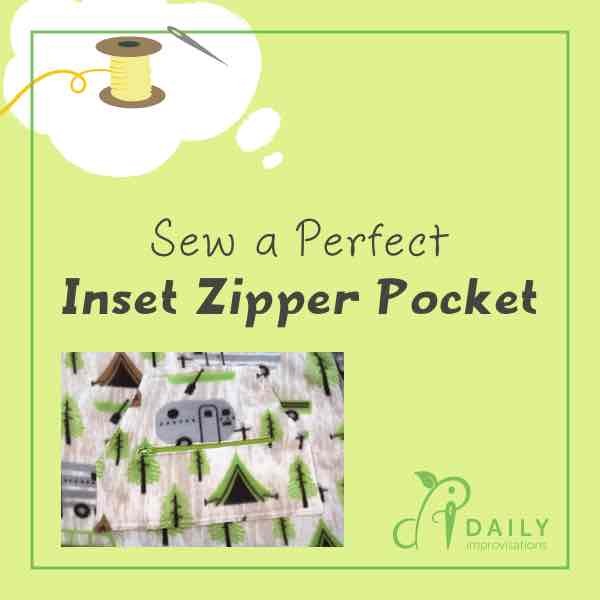 It is easier to sew an inset zipper pocket than to sew a zipper in a garment. 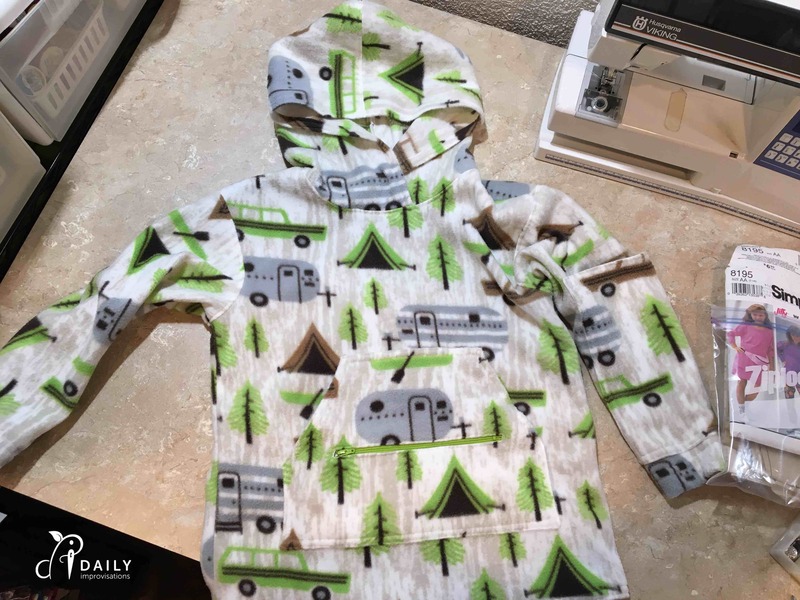 Below is a video of an inset zipper pocket that I put on and into the hand warmer pocket of my young grandson’s polar fleece tunic. 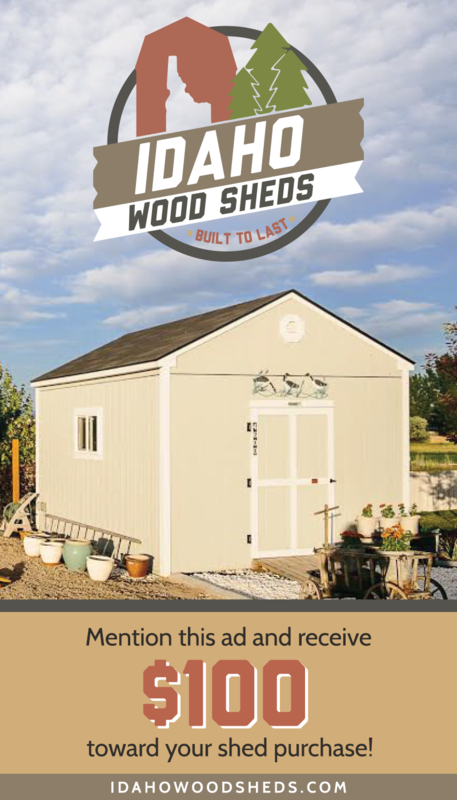 I demonstrate all the steps and give specifics for this particular project. Now my grandson can put his hands in the hand warmer pockets, but still have some cherished item secure behind a zipper. Here is a photo of the finished product, which was a hit with my grandson!